Less than a week after sources confirmed that Bobby Moynihan, one of Saturday Night Live’s longest-serving cast members, was departing the NBC sketch show, another long-time vet has also announced that she’s making the jump. 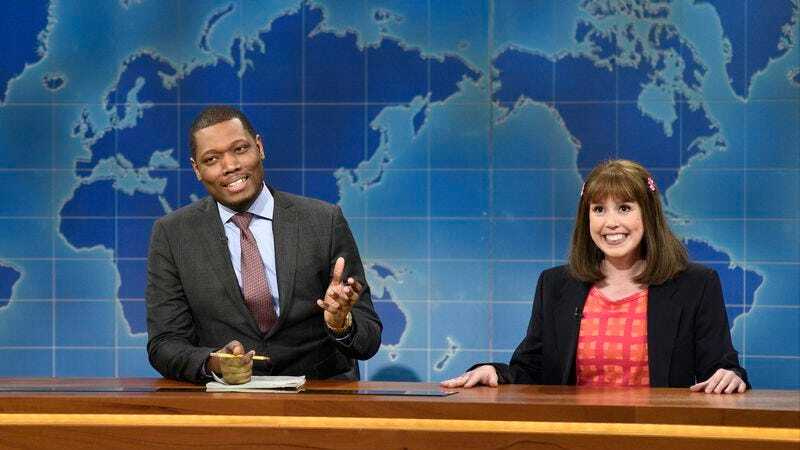 Deadline reports that Vanessa Bayer, who‘s spent seven years on the series, will be leaving Studio 8H after the show’s 42nd season wraps up with tonight’s Dwayne Johnson-hosted finale. A Second City alum, Bayer joined the show back in 2010, before being moved up to repertory status in 2012. Although never as high-profile as some of her castmates, Bayer has been a reliable and consistent player over the years, bringing to life everybody from her slurred-voiced, whacked-out Miley Cyrus, to recurring Weekend Update character Jacob the Bar Mitzvah Boy. She also held the distinction of being SNL’s current longest-serving female cast member, a title which now falls to Kate McKinnon, who debuted on the show in April 2012. Outside her SNL duties, Bayer has been steadily accruing film roles and other TV work; her recent credits include Trainwreck and Office Christmas Party.